Both are the flipside of the same phenomenon, which has been brewing for many years but is now in full display: just about everything (whether personal or professional) is rapidly getting digitized, and data technologies are becoming more adept than ever at processing and analyzing this massive data exhaust, increasingly in real time. From this can result from both magic and abuse. The debate on how to combine this great power with a necessary sense of responsibility has become essential. From an industry standpoint, the data ecosystem remains as exciting and vibrant as ever, with a rich tapestry of innovative startups, mature “scale-ups”, and many aggressive public technology vendors. Most importantly, many customers large and small are deploying those technologies in production at scale and reaping undeniable value from their efforts. In addition, the data world continues its inexorable evolution towards the cloud. It is actually staggering to see how fast the large public cloud providers (AWS, Azure, Google Cloud Platform, IBM) are growing, considering they already each generate billions of dollars of revenues every quarter. The trend raises ongoing concerns around vendor lock-in, and this may open up opportunities for startups offering multi-cloud solutions. However, to date, even companies adopting multi-cloud strategies tend to still rely on one vendor as their primary provider. As they keep growing, large cloud providers increasingly compete with each other by offering a wide array of Big Data, data engineering, and machine learning tools through their platforms (e.g., Amazon Neptune, Google AutoML, etc.) – and often with aggressive pricing, to attract more developers, as their true business model is data storage. As the scope and sophistication of such tools keep growing, this has a big impact on the data technology landscape, making it arguably harder for startups to compete, at least for broad, horizontal opportunities. A bit more every year, the list of product announcements at big annual cloud vendor conferences (see AWS re:Invent, for example) sends shockwaves in the startup industry, as they put cloud vendors in direct competition with dozens of VC-backed startups in one fell swoop. It will be interesting to see how public markets react to the upcoming Elastic IPO, an open-source software company that saw Amazon launch a direct competitor, Elasticsearch, three years ago. The Cambrian explosion of deep-learning based startups that started a year or two ago has mostly continued unabated, even though the AI startup market is (arguably) showing signs of finally cooling down. Expectations, round sizes, and valuations remain high, but we are certainly past the phase where big Internet companies would snap up very early AI startups at high prices just for the talent. The air is also clearing up a bit and revealing “real” AI startups, versus a number of other companies that were leveraging the hype. Some of the AI startups that were founded in the 2014-2016 time frame are starting to hit early scale, and many are offering increasingly interesting products across industries and verticals including health, finance, “industry 4.0” and back office automation. Deep learning will continue bringing a lot of value in real-world applications for years to come, and vertical-focused AI startups have many great opportunities ahead of them. In the same vein, issues of data privacy (and ownership and security) are emerging as a major concern around the world. In the early days of the Internet, data privacy was about protecting what we did online, a comparatively small portion of our activities. Correspondingly, only a small (albeit vocal and passionate) minority of people truly cared. As just about every aspect of our personal and professional lives is now connected to the Internet through an ever-increasing array of connected devices, the stakes are changing. With its ability to spot anomalies in massive data sets, predict outcomes and recognize faces, AI is compounding the data privacy problem. Quite semantic note: buzz terms come and go. Fewer people speak about “Big Data”, many more about “AI”, often to describe the same reality. 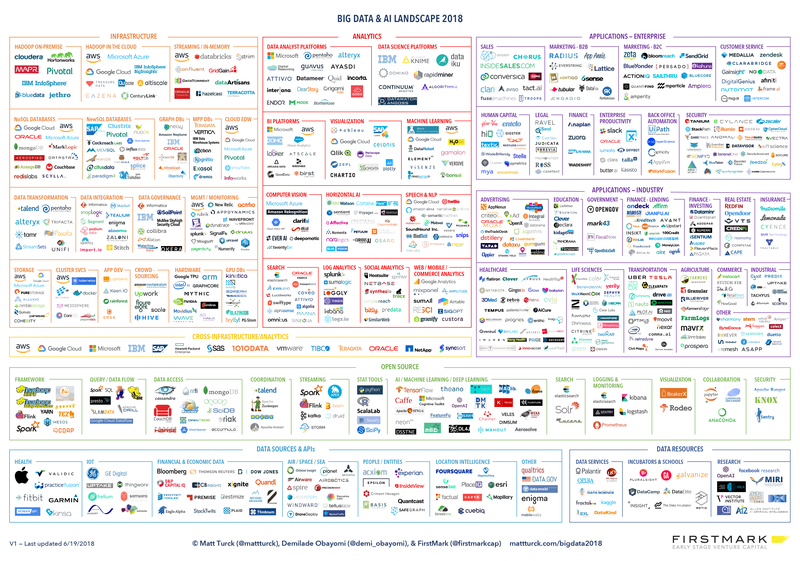 Consequently, we have slightly rebranded our 2018 landscape: it is now called the “Big Data & AI” landscape! A few key companies appearing on the landscape went public, in particular, Cloudera, MongoDB Pivotal and Zuora. Others are preparing to go out at the time of this writing, such as Elastic. Some notable acquisitions also occurred, including in particular Mulesoft (acquired by Salesforce post-IPO, for $6.5B), Flatiron Health (acquired by Roche for $2.1B), Appnexus (acquired by AT&T for $1.6B), Syncsort and Vision Solutions (acquired for $1.2B by Centerbridge Partners), Moat (acquired by Oracle for $850M), Integral Ad Science (acquired by Vista Equity Partners for $850M), eVestment (acquired by NASDAQ for $705M) and Kensho (acquired by S&P Global for $550M). It is worth noting that, other than Mulesoft, all those companies are headquartered on the East Coast (New York, Boston, and Atlanta).